Stunning pool home in prime Biltmore location! Beautifully remodeled 4 Bed 3 Bath, featuring 2 master suites, large contemporary open-plan kitchen, spacious great-room. The design and quality of work sets this house apart from all others! Entire home updated: new kitchen, high-end appliances, oversized kitchen island, gorgeous bathrooms w/ modern fixtures, designer tile, fully remodeled bedrooms and living areas w/ neutral palette. New electrical, flooring, brand new 2-car garage, new plumbing. An entertainer's back yard w/ diving pool, large patio, pergola. No HOA, gorgeous upscale neighborhood. Great Madison Schools. 2 min drive to Biltmore, SR51, Whole Foods/Trader Joe's. Mature fruit trees. 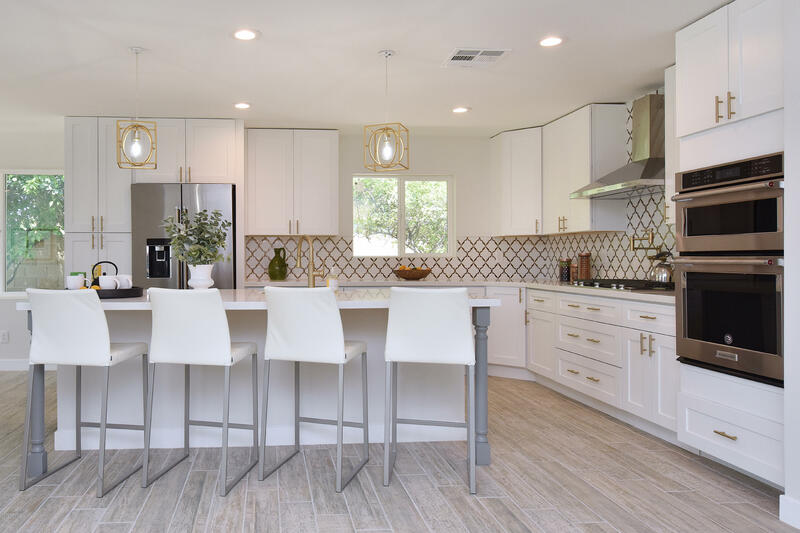 All work by licensed contractor, architectural firm/fully permitted, approved by City of Phx The seller has taken great care and pride to remodel this house. No details were overlooked; it is stunning! Class and quality were driving forces behind the love that has gone into updating this home. The seller hired an architect and licensed contractor to bring the home up to date. All remodel and engineering have been permitted and have approved by the City of Phoenix. Much of the old house interior was gutted to accommodate the large open plan design now present. With this house you will get a large open floor plan perfect for families or those who entertain. Some of the many upgrades you get are: new electrical wiring and panel, new interior water lines, new low-E dual pane windows, new floor coverings, kitchen & bathrooms. The fabulous open kitchen was built to be a home chef's dream. Featuring all new cabinetry w/ soft close doors and drawers, high-end KitchenAid appliances (built in microwave/oven combo, counter-depth fridge, gas range, hood vent and dishwasher), pot filler faucet, farmhouse sink, large island and beautiful quartz countertops! A second master bedroom has been added with full bathroom providing a special dual/split master layout. The new master suite features french doors that open onto the backyard oasis for easy access to the pool and cabana. Existing master suite has had the bathroom and his/her walk-in closets expanded to meet today's buyer needs. Featuring dual sink vanity and large shower. Move in ready!